You treat your readers like grown-ups, right? You give them all the information they need to make a choice. Your copy sounds smooth. Your words seem perfect. You’ve presented the arguments to take action—to contact you for a quote, to buy your latest product, or to join your valuable email list. But when you re-read your words, your content feels flat. The copy seems to lack the powerfully persuasive tone you sense in content written by the pros. Writing seductive copy like the pros isn’t as hard as you think once you understand how people choose to buy. Let me tell you a quick story about a conversation I had a few years ago. The type of guy who negotiates the best bargains and keenest deals from his suppliers. In his late forties, he owned a bricks-and-mortar store and had a pretty big online presence. He told me he had purchased a new bike. His sixth or seventh—I can’t quite remember. He proudly revealed the cost of the bike … a whopping £7,000. That’s over $10,000. Or more than 10 times as much as my bike which I’ve ridden in Malaysia and Thailand, across the Pennines in Northern England, and from France across the Pyrenees to Spain. What made his bike so special? He explained to me his bike was super-light. You could almost lift it up with one finger. But unless you take part in the Tour de France, does having a super-duper light bike matter that much? Is the purchase of a £7,000 bike a rational decision? Or is it about prestige, a sense of belonging, the proud feeling you ride the same bike as the pros? As buyers, we justify our purchases with rational arguments. We bought that BMW because of its driving experience. We bought that iPhone 6 because it’s much much better specified than our old iPhone 5. But the truth is that we get attracted to a brand, a model, a design, and then find a way to justify our purchase. Emotional appeal comes first, rational arguments come second. But how does that work in practice? How can you mix emotion and logic when you don’t have a multi-million dollar marketing budget like Apple or BMW? How does your product or service transform people’s lives? How do you make buyers feel better? For over 10 years, millions have relied on Basecamp to help them get their projects done on time, on budget, and on point. It’s their go to—and ours too: We use Basecamp every day to run our own company. Combine that with our best-in-the-biz customer service, and you’ve got a powerful package. Just last week, another 4,869 companies started using Basecamp. The first paragraph uses emotional phrases: wrangle people, a common goal, finishing a project together. The next paragraph uses hard facts: over 10 years; on time, on budget, and on point; 4,869 companies. Note how the specific number 4,869 is more persuasive than the rather vague millions who have relied on Basecamp. To implement this approach in your copy, think about what your customers want to achieve. How do you make them feel happier, more relaxed or more productive? Then back this up with facts. Can you make the emotional appeal stronger with a more sensory description? [T]his drink tastes of sunshine. Not that watery stuff that you get in the UK for five or six days of the year, but the great, clear, life-affirming rays that you’ll only find where these fruits are grown. So even if you’ve used up your holiday allowance on lots of mini-breaks to Prague and Oslo, you can still find a little bit of the tropics in this recipe. Just close your eyes, whack on the factor 16 and have a mouthful. Il fait soleil. You can almost feel the sunshine on your face when reading the copy. Note the sensory words used: not that watery stuff; the great, clear, life-affirming rays; tropics; whack on the factor 16; il fait soleil. The copy smartly links a simple smoothie with a sunny vacation experience. Once you’ve read the intro, you can’t help yourself wanting this drink, and then you find the reasons to justify this expensive purchase: 2 of your 5 a day, 6 different types of fruit, vitamin c.
To implement this approach, consider how your service or product makes customers feel. How can you describe this feeling? Can you associate this feeling with another experience (like drinking a smoothie makes you feel like lounging in the sunshine)? Which sensory words can describe the experience? When we think about our service or products, we tend to think about the positives. We know how we can help people save costs, make more money, or become more productive. But what about the fears and problems we take away? Our deployment technology allows you to instantly start building a powerful marketing and sales website without the frustration that comes with do-it-yourself WordPress. Experience (…) the peace of mind that comes from never having to worry about updates, theme breaks, outdated plugins, and site-specific security threats ever again. They use emotional words to describe the hassle they take away: brain overload, frustration, problem; and to describe the transformation: peace of mind. They back up their claim with specific facts—you don’t have to worry about updates, theme breaks, outdated plugins, and site-specific security threats. To implement this approach, consider what your customers are worried or frustrated about. Which hassles, glitches, and problems can you take away? 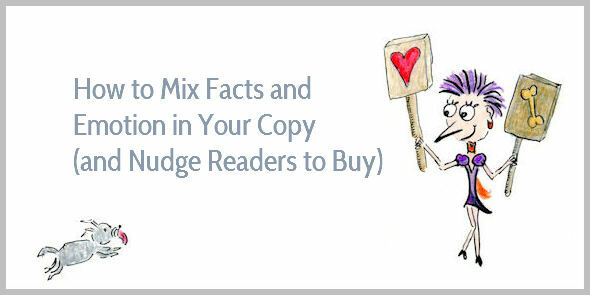 Make sure you include specific facts to reassure your readers that it’s not just empty marketing talk. Writing copy like a pro is easier than you think. To seduce your readers to buy, appeal to their emotions and help them justify their actions with logic and facts. Thank you for more great content! Very much appreciated. It’s always so human, engaging, friendly and warm. As well as practical, logical, helpful and factual. I think you combine emotion and logic very well yourself. Thanks.. and keep writing so well. Thanks again Henneke for some good advice. Keep em coming. Hope you’re enjoying your semi break. Loved the article and your use of specific examples. The emotion “buys it” and the rational thinking justifies it. Oooh, I’d totally forgotten about that. *scratches her head* I can’t remember either where I’ve read it, but it’s fascinating, isn’t it? It seems that at school we’re all taught to behave like rational beings and to treat each other rationally – like using rational arguments to win fights, but the truth is that emotion plays a much big role than we imagine. Have you read the book Predictably Irrational by Dan Ariely? Thank you as ever for such great advice – it all makes such good sense. Just off to put it in practise!!! This is one of my all time favorites. I’ll be making a list of emotional benefits today. Straightforward, clear and actionable. As always, you provide excellent advice. Thanks for all you do, Henneke. Seduce your readers … appeal to their emotions and help them justify their actions – And know your customer/reader. These are important. Knowing what they want, what they’re looking for, what they can’t find where they’re looking now – this is important too. It’s the hook those other 3 hang on. It’s what lets you seduce, appeal and help … It’s a lot easier when you know what their desires are. And, it’s what needs most of your time and attention. Yep, that’s so true – if you don’t know what your readers’ desires are, you can’t appeal to them with your copy. Good to “see” you again, Tom. Thank you for stopping by. Thank you for this great post–your examples are fantastic. Maybe you’ll have a rainbow. ( : Thank you for being such a good teacher and sharing your gifts. I adore your book and guides. Jenny. I love rainbows. There’s something magical about rainbows. This is really great information. I have to start printing off your posts and use them as references like I did with the Gary Halbert Letter when I was fully engrossed in CopyWriting. You are a wizard with your words and your writing style. Love your point about intensifying the emotional appeal. When you can visualize, feel, or taste the words that’s being written, that’s some powerful stuff. And it draws people in more. I really learned how to write blog posts from studying and analyzing blog posts – both posts I like and posts I found boring. This is something I still do. Even when I read a novel just to relax, sometimes a word or grabs my attention or I notice a technique I like. I can’t stop myself 😉 Learning to write is a life-long process. Glad you enjoyed this one, Andrew! Spellbinding! Your potion of word wizardry packed with practical useful tips have me hooked. As others have mentioned, I too keep your posts as handy reference guides – top value! The real human touch you invest makes it feel like I have a coach-in-a-post. Thanks and keep them coming. I like that expression: a coach-in-a-post. I think that’s the main role of a blogger: to be a coach or mentor for readers. I think it’s the best way to build authority, engage readers and make them come back for more. Very helpful. Let’s face it, we’re all human. Emotions are the easiest way to connect to others. And maybe that’s what blogging is all about, no matter what type of blog it is. Its all about connection. Thanks! Yep, I agree – we’re not writing for pixels or Google bots, but to connect with our readers. If your words were precious metal, this post would be platinum! What a joy to taste your work! As always, you’ve provided helpful tips that can be immediately instituted in our content writing. Thanks for another great post! Thank you, Terri. Happy writing! Thanks for this article. Isn’t it funny how sometimes someone needs to point these things out like you did so we can see the simplicity of it. Very helpful, thanks. Thanks ever so much Henneke. I’m so glad it’s helpful, Njomza. Happy writing!